Standard – Includes standard devices, smart home control, and life safety. Essential – Includes all standard features plus home automation and HD video doorbells. 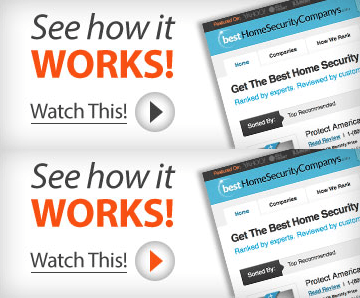 Premium – The most complete home security system with home automation. Includes all features of the other packages plus smart home control. Monitoring: In addition to the landline monitoring services found in most home security systems, Guardian Protection also provides backup cellular monitoring services in the event that your electricity goes out. Guardian Protection also employs Smash-and-Crash technology to ensure homes remain protected even when the system is tampered with or destroyed. Guardian System: Every home security system sold by Guardian Protection Services is custom-designed and professionally installed. Guardian Protection offers a wide variety of equipment so you can tailor your system to include a sensor and control for your garage door or video surveillance in your backyard. Higher Costs: Guardian Protection boasts high-end, cutting-edge technology and equipment however, customers may find themselves paying a bit more for Guardian Protection’s equipment and protection plan than they would with other industry leaders. Repair fees outside of Guardian Protection Service’s extensive warranty can also be quite costly. Transparency: There appears to be some confusion with regard to specifics surrounding Guardian Protection’s advertised contract lengths and cancellation policy. This confusion is due in large part to Guardian Protection’s poor online transparency as well as its method of contract delivery. Our Recommendation: Despite offering high-end technology and security packages, customers looking for an affordable and reliable home security may want to look into other providers like Protect America and Frontpoint. Call our recommended rep over at Guardian Protection below. They are responsive to phone calls. The equipment is durable. I have had it for 20 years and have had no problems. They are conscientious, timely, and cost effective. What more could you ask for? Every time I call, they either answer immediately or call me back right away. I have had some technical glitches in the system, but overall it has been good. The technician that has come out has been excellent. I have had a couple of switch failures. One has been replaced twice and is still failing and needs to be replaced again. Guardian installers and customer service techs have been wonderful. I am not thrilled with how my doorbell works. Cannot adjust it to not pick up large street traffic 30′ away. Works as designed up close. Wish the billing was a little more detailed. We ran the full sixty months and cancelled the service which we were satisfied with. I wish they would collect their equipment that is no longer in use is my only concern, so I am just removing it myself. I’ve been with guardian since 06 and was pleased with their service until they did some work and charged me for a bad part and extra labor because they tried to figure out why the audio wasn’t performing well. I have asked them to come get their part and they can check if just to make sure and even deduct some of the labor because it is their fault. This has been since October of 2018 and I’m still waiting for them to do something. I asked them to email the ticket to send the part back and still nothing. So tired of them , I will be taking my business elsewhere. DO NOT USE THIS COMPANY! They are so accommodating until you sign up. They have a 60 month contract and will not let you out of it even if you move. This is a BIG SCAM! This is worse than cell phone companies, except here you pay fees up front for installation and your package then double the charge of a normal company for monitoring. After 2 years of use with excellent payment history, they require the remaining time of the 60 months to disconnect. What a rip off!!!! I had to have a service tech come to my home for an issue with my system. Denise was great!! She was very knowledgeable and explained everything in detail. If I need to have a another guardian tech come to my home, I will be asking for Denise. AWFUL SCAMMING COMPANY!!!!!!!! They have no problem signing you up for service but if you move and they can no longer provide you service they demand $750.00 cancellation fee regardless of the time remaining on your initial contract with them. Neither ADT or AT&T U Verse will charge a cancellation fee if you move out of their service area beware all of you home security seekers. Guardian is a 100% SCAMMING RIP OFF!!! Very dissastified with their lying ways, and gangster tactics. I really think they are suspicious. We’ver had them out several times to fix a camera in the front, and payed the $113 for labor, the camera still does not work. Who has time for this below standard service??? Then to be told, “the Alarm Stay feature goes off immediately when you open the door from the outside…” Not true!!! I’ve put Alarm Stay for over a year every day, and there is 30 seconds to turn it off when I open the door from coming home at the end of the day. Kinda makes me think maybe their gangsters are coming into my house for whatever reason they want….Now I’m locked into a contract basically paying for nothing!!!!! It is time for a class action lawsuit, please, anyone, do you have a lawyer we can group together for a lawsuit!!!!!!!! Please lawyers – DO YOUR JOB! I never signed a contract for home security. Three months after I moved into my house I received a bill for $39.99. Guardian installed wiring for my tv’s which I signed and paid for. I never signed for home security. The last four of my ss number on the form is not accurate and it has my electronic initials, which anyone can place on the form. The worst customer service ever! My home has been broken into 3 times since haveing guardian, 2 of the 3 times the equipment malfunctioned and didn’t go off until after the burglary was over. When i call to cancel they throw the contract in my face and I get a different story every time about cancellation fees, I was initially told that there is no cancellation, then I was told that cancellation would be the entire cost of the remainder of my contract, now that I only have a few months left, I’m being told that the cancellation fee is a flat rate of over a thousand dollars. This this is nothing but scumming people .wost service i never seen before.they literally lied to us , now stuck on 5 year contract without our consent.you love your 💰 run if you see them. Aggressive sales person, Steve Silverman. Sold products to us that were not necessary, had to pay for additional sensors and was never told there is a limit to the number of video doorbell clips that can be recorded: nor is it mentioned in the contract. First they told me 1000 clips now they tell me 400. Forced to go with them because of the builder. Had I known any better I would of waited and went with ADT. Fortunately I was able to get the contract down from 5 years to 3. Stay away from this company. We got guardian July of 2014 they took over our old adt system motion sensor and fire alarm sensors had false alarms or no alarm.only 2 door sensors are guardian in January of 2019 tried to cancel service but they said it would cost more than 900 dollars to do that just completely dissatisfied with system and company. They have the worst customer service workers over the phone. I just had another remarkably poor experience and when I told my husband about this, he reminded me this is typical of them. Of late, our whole house was beeping loudly due to a faulty smoke detector not being plugged in while we are trying to replace it on one floor. The woman I spoke with could not be bothered to send information on how to disable the alarm system however, but instead encouraged me to look online at their multiple systems (not giving a direct web link, as information for our particular system could not be found) to see online how to disable the alarm. This information could not be found in a remotely timely manner because they make various systems to review. So I ended up having to pull the wires off of the battery pack she previously assured me was removable– it was not. This just feels like the final straw– I do not want to go with them anymore. Their products are cheap; we even once had a false alarm where the cops came because one of their cheap door alarms simply fell down because of its cheap adhesive. I may be able to tolerate their cheap products however if it were not for the routinely poor customer service over the phone. No one enjoys routinely horrible customer service. I am updating my review from December 20, 2018 where i was highly dissatisfied with having to pay an early termination fee after being a customer for over 13 years. To my surprise, I received a call from Guardian’s Customer Loyalty representative who said my review was brought to their attention. She was very helpful and was able to give me a more desired payout of the contract. If you are a loyal customer and find yourself in the same situation, ask to speak with someone from their Customer Loyalty department. They do work with you and did help me. Also, I do want to say that the system itself was perfect. We never had any issues and they are very responsive when you get an alarm. The first 3 years with Guardian was great then something happened to them. I guess the founders sold the company and service went downhill fast. They only respond to test alarms about 50% of the time. The people they sent out to service my account are untrained and not to smart. They made 4 or 5 trips just to change some batteries then told me that they forgot to bring the batteries. They make appointments then show up 4 hours late, sometimes not at all. I have 4 doors but these yoyo’s can only get 3 of the contacts to work after 4-5 service calls. I would strongly NOT RECOMMEND this company ! We have been Guardian customers for 4.5 years and changing over to another monitoring service to save money ($34.88 to $8.95/mo.). Even though the equipment is ours, Guardian refuses to give us the ‘Installer Code’ which is needed for the new company. Borders on illegal as it is OUR equipment and Guardian installed a code that renders the system unusable unless they are paid a monthly fee. They would not even return it to the manufacturer default code. Very disappointing and I would advise anyone to BEWARE!!!!!!!!!!!!!!!! We paid a substantial sum of money to have the security system installed. Apparently we still must have signed a 5 year agreement. With 16 months of service left under the contract, we needed to cancel our system. READ YOUR CONTRACT CAREFULLY. No other company I have dealt with (3 others) has such a contract when you pay much money for hardware installation. Their monitoring service was fine. It seemed like all the others we have used. It was a little more expensive. I realize the mistake was mine. I never expected such a bad deal. I will certainly NEVER us Guardian again.